They were great, communication was great too (in terms of sorting the courier) and their prices are fantastic, quite hard to beat. Excellent company. Great products. Would use again. This is a complete pre-wired outback system ready to go, it includes breakers so you simply wire to your batteries and away you go. We have been using outback equipment for The Bimble Inn for over 10 years and can highly recommend them. They are solid reliable units with a 5 year warranty. This pre-wired system is great way to have an advanced system professionally wired together as a plug and play system! 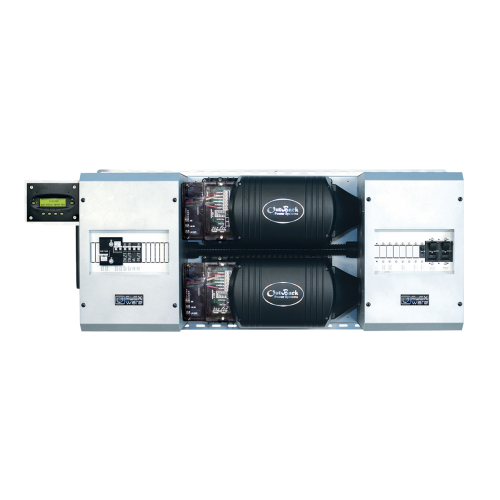 OutBack’s pre-assembled and pre-wired FLEXpower systems are now equipped with the updated FXR Series Grid/Hybrid inverter/chargers. This means that the most advanced Grid/Hybrid inverter features are now available on the industry’s most trusted and proven systems platform, for unmatched flexibility and value. 7 models available for 120VAC or 230VAC applications, ranging from 5000W to 7200W. 50Hz/60Hz selectable for regional diversity. Programmable for seven different modes including GridZero ,which blends utility power and stored renewable energy, minimizing grid dependence; also Support Mode for seamless generator integration. Advanced Battery Charging (ABC) with expanded charging voltages and time parameters accommodates charging profiles of new and emerging storage technologies including Lithium Ion, and Aqueous types. Field-upgradability eliminates system down-time for critical updates. Remote system control and monitoring available through any internet-enabled device with OPTICS RE. The FLEXpower TWO is an ideal full-sized solution for residential and commercial applications including homes, farms, small businesses, and back-up power systems, with all necessary components integrated into a compact hang-on-the-wall system with a minimal footprint.